Arrive at Maun Airport, where you will clear customs and immigration and collect your luggage. You will be met in the Arrivals Hall by a representative of Moremi Air Charters, who will accompany you to the light aircraft for your 20 minute flight into Pom Pom Camp, across the Okavango Delta. Pom Pom Camp is located on Pom Pom Island, in a private concession situated in the heart of the Okavango Delta, and on the head waters of the Xudum river system. 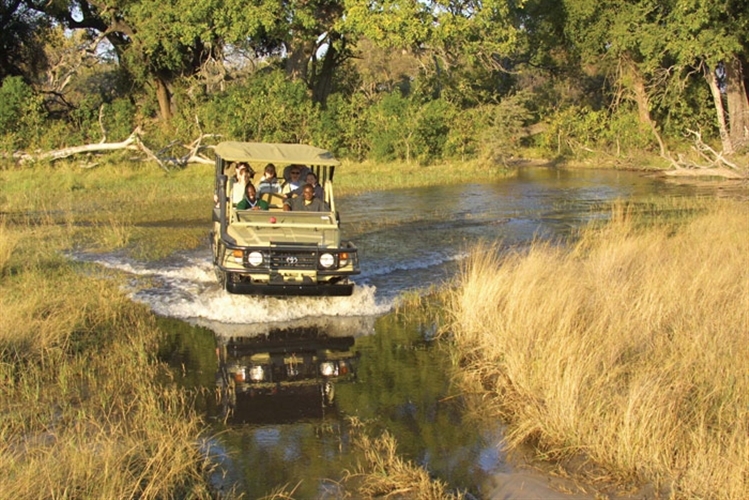 The area lies on the western boundary of the Moremi Game Reserve and offers superb Okavango scenery and a true Okavango wilderness experience. This is a safari camp built and designed in the style of safari camps of old, overlooking a scenic lagoon and under a grove of shady trees. This is a camp for the safari traditionalist. 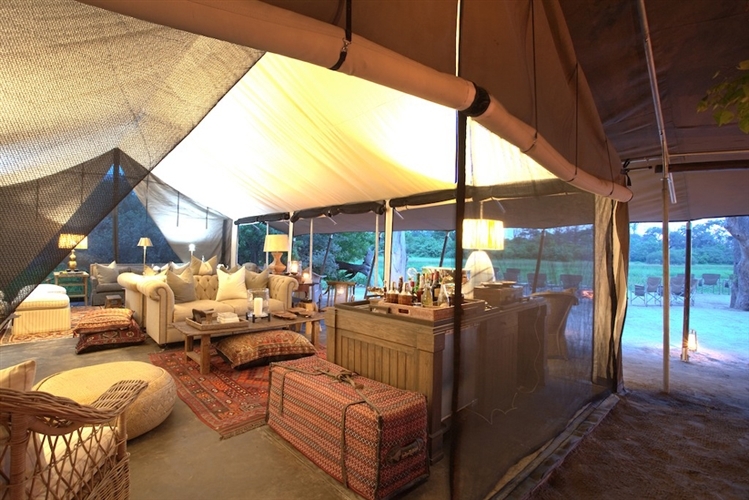 Pom Pom has nine large walk-in tents (18 beds), in true traditional safari style, all with full en-suite facilities, flush toilets and semi open showers, - for a true bush experience! The main building is attractively designed and constructed of thatch and canvas and comprises lounge, dining, and bar area, as well as a gift shop and the boma pool. There are battery-operated lights in the rooms, and battery charging can be done in the main building. At night, paraffin lamps give a wonderfully warm atmosphere. 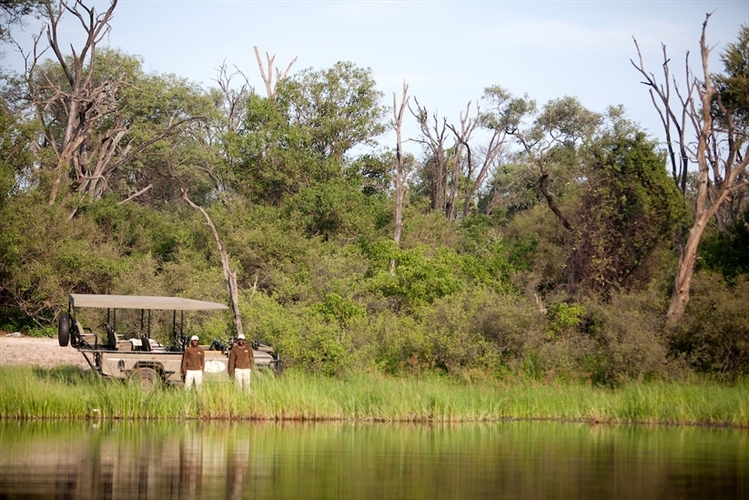 Following the afternoon tea, you will depart on a game drive in an open 4x4 Land Cruiser, stopping for a break and a traditional Botswana "Sundowner". Hippo and crocodile are found in the deeper lagoons in the area. You will return to camp in the dark, using a spotlight to hunt for nocturnal species. Night drives provide an opportunity to see nocturnal sightings of leopard, spring hares, genets and other small cat species if you are very lucky. After the drive, you will enjoy an outdoor dinner overlooking the Okavango, and share the evening with the others in the group around the campfire. After a light breakfast of cereals, yoghurt, muffins, fresh fruit, and a bracing cup of coffee or tea, you will explore the delta in the traditional way. Poled silently, the mokoro glides gently through the waterways, parting dense reed beds with perfect stealth so that animals and birds are caught totally unaware. You will stop on an island for a Tea Break and a short nature walk, before returning to camp for a hearty brunch. Like most of the animals, you will have siesta time through the heat of the day, so bring your swim suits and enjoy a refreshing dip in the pool. 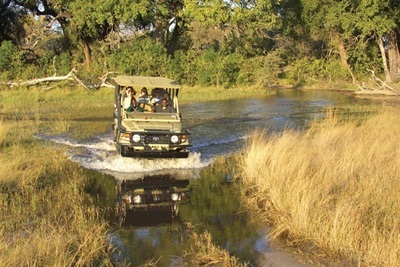 Morning activities are mokoro excursions, early game drives, or nature walks. Afternoon game drives start after tea, and return to camp after dark. After a light breakfast and an early morning activity and brunch, you will be transferred to the airstrip for your charter from Pom Pom Camp to Machaba Camp, 30 minutes away. 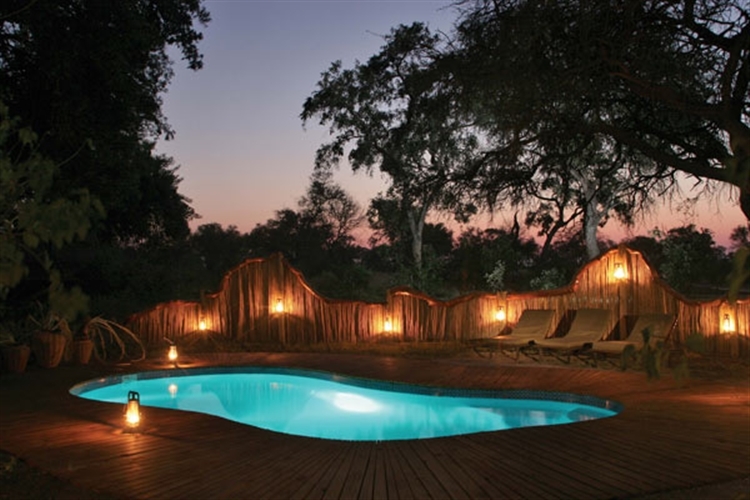 Machaba Camp is located along the Khwai River on the edge of the Moremi Game Reserve, and offers spectacular game viewing. Elephant abound, often passing by the camp in search for acacia pods on their way to the waters of the Khwai River. Machaba's tents are on the ground amidst a riverine forest, with old knobthorn, red bushwillow, raintree and leadwoods above and around it. The camp is built in the classic 1950's style, with luxury safari tents, en-suite bathrooms and living areas, not forgetting the romantic outdoor showers. Pathways to the tents meander between the large riverine trees. All 10 luxury tents are situated in the beautiful riverine tree line on the Khwai River, overlooking the famous Moremi Game Reserve. From these tented verandas one can watch the daily parade of animals coming down to drink at the river in front of camp. 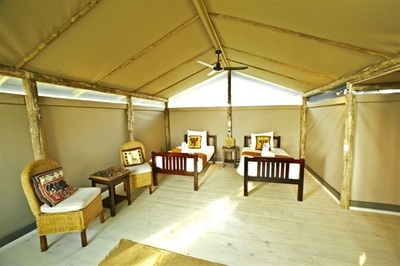 Machaba Camp has two family tents. There is a swimming pool, with loungers, a tented main area, and a camp library. 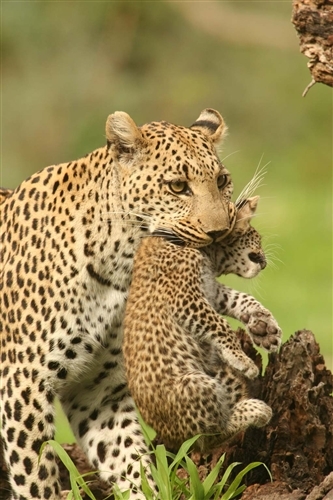 You may even see the elusive leopard and a profusion of smaller nocturnal animals. At dusk, the sand grouse fly down to the banks of the river and the hippos leave the water in search of the night's pastures. A night drive at Machaba reveals another world -- bush babies, hyenas, jackals and genets will all show themselves, as well as nocturnal birds. Khwai is truly one of Botswana birding Mecca’s. The western reaches are prime habitat for the uncommon Rosy-throated Longclaw. The entire length of the river is hunting domain for the Bat-Hawk. After your morning activity and brunch at Machaba Camp, you will be chartered back to Maun Airport (30 minutes), in time for your onward arrangements.